The Logitech FreePulse Wireless Headphones are liberating in that you can leave the chord behind. This device uses Bluetooth and has a range of about 30 feet. The sound quality is good. The headset is comfortable and flexible. There is a volume toggle control built into the right ear piece. Best Buy is selling them for $99.99. 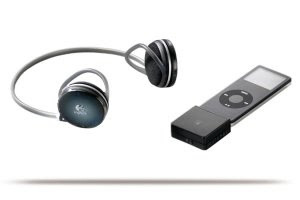 I'll be using this wireless headphone with my iPod, laptop, and Tivo late at night. If they were waterproof I'd rock on in the shower.